Just a quick post. As I am going through my web bookmarks to various Microsoft Forums, I came across a power users community site that links to new tools that integrate with Office 365. You already maybe aware of these forums and then there is the new Office 365 Network in preview and Yammer hosting the Office 365 Network is retiring. Of course there are legacy forums still available such as technet and MSDN forums too. The key point is here that anyone can contribute their findings, questions, problems and above all using just one Microsoft personal account except Yammer. Office 365 Network (Preview) – https://network.office.com/ – sharing for information. Microsoft Community – http://answers.microsoft.com/ – help with technical support. 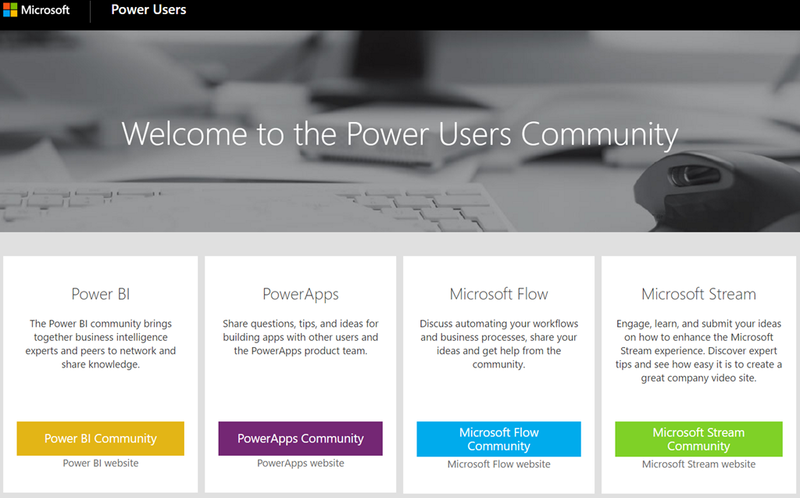 Power Users Community – https://powerusers.microsoft.com/ – Gateway to Power BI, Flow, Power Apps, Stream communities forums. Microsoft Technet – https://social.technet.microsoft.com/Forums – for IT Professionals technical support. Have I missed any other useful Forums supported by Microsoft staff? Please feel free to add in the comments and I will update this post.